The UT System allocates more than one-third of the money in the Available University Fund directly to UT-Austin, and the campus is growing more dependent on these allocations as state funding shrinks. While the funding the University receives from the UT System only makes up about 7 percent of the University’s $2.48 billion annual budget, the campus remains the largest recipient of System funds, using the allocations for projects as far-ranging as the Dell Medical School and the Engineering Education Research Center. Scott Kelley, the UT System executive vice chancellor for business affairs, said roughly 45 percent of the money is intended to fund “excellence,” lending UT a competitive edge, especially when the University attempts to attract faculty. “If we’re recruiting a biologist, they might want a lab re-fitted — we can get money to fix up a lab, buy equipment for research,” Kelley said. The 2.1 million acres of oil-rich land that make up the Permanent University Fund, a 137-year-old state endowment, support the UT and Texas A&M systems. Though the fund itself cannot be spent, as mandated by the Texas Constitution, profits from land lease sales and oil and gas production revenue are invested. A portion of the returns from these investments make up the Available University Fund. For the fiscal year ending in August, the AUF had almost $644 million. 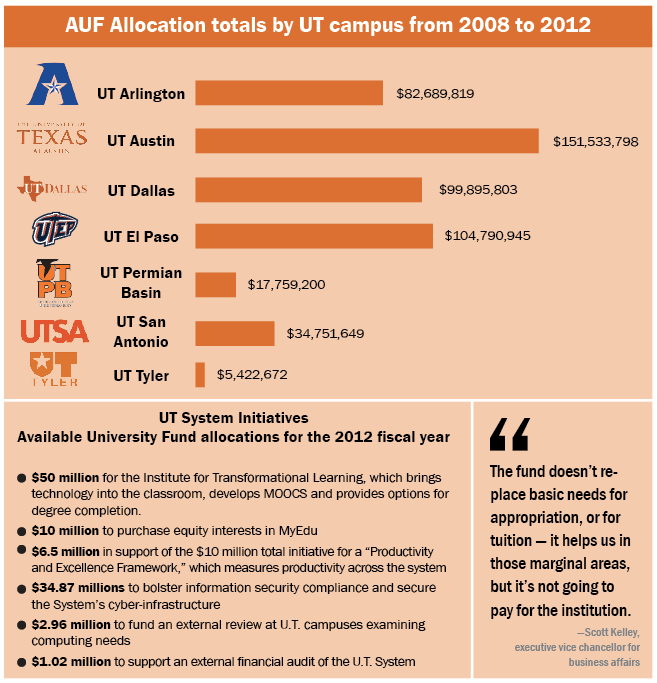 Once the AUF total is determined, two-thirds of the money is allocated to the UT System for the Board of Regents to then allocate to the System’s nine academic institutions and six medical schools. Still, Kelley said, the money from the fund is not enough to comprise an entire operating budget. AUF money, gifts and endowments take on a new importance in the face of decreasing state funding for the University. In the 1984-85 school year, state general revenue represented 47 percent of UT’s operating budget. Today, it represents 13 percent. While 45 percent of the UT System’s AUF money is already distributed to UT, the University’s portion of the fund could increase over the next few years with the creation of the Dell Medical School. Last year, the Board of Regents committed additional funding for the creation of the Dell Medical School. This contribution, forecast to begin in 2014, will total $25 million annually for the next several years and will eventually increase once the school is established. Mary Knight, UT’s associate vice president for financial affairs, said the money allocated to the medical school will initially be used for start-up activities and salaries because the school is still at the beginning of the development process. “We don’t quite have a dean yet, but [the medical school steering committee] is using it now for kind of start-up activities … there are people who are appointed to work there, some full-time, some part-time — and those people are being paid from the funds,” Knight said. Beyond the money directly given to UT, a portion of the UT System funds are also allocated for System-wide initiatives that also benefit the University. For the 2012 fiscal year, such projects included $50 million for the Institute of Transformational Learning, an organization created by the board to build the System’s online learning efforts. UT professors currently teach four massive open online courses — better known as MOOCs — which each cost $150,000 to develop, as part of the System’s online learning initiative. The System also designated $10 million to purchase stock in MyEdu, an online course directory, with the intention of increasing graduation rates by facilitating course schedule planning for students. Though some money from the AUF helps fund construction projects at all UT institutions, the money alone is not sufficient to fund new projects like the planned Engineering and Education Research Center. This leaves system institutions dependent on state funding. The engineering building, and other planned UT construction projects, did not receive expected state funding through tuition revenue bonds earlier this year. A package of tuition bonds that would have provided more than $2.5 billion to campus construction projects statewide was not approved despite bipartisan support during the regular legislative session and the Texas Legislature’s two special sessions this year. Knight said the budgeting process usually depends on several variables but has been more difficult in recent years because of decreased state funding. Correction: Because of an editing error, the graphic on an earlier version of this story used an incorrect logo. The logo should have been from UT-Permian Basin in Odessa.